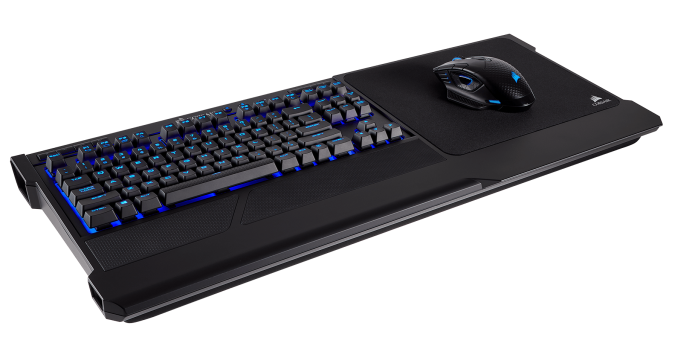 LAS VEGAS, NV — Corsair has announced a companion to the K63 Mechanical keyboard with a wireless K63 version and a new lapboard accessory. The K63 wireless adds 2.4 GHz Bluetooth connectivity and 75 hours of battery life (without backlighting - 15 hours with). Though not an exclusive, Corsair touts the use of 128-bit AES encryption to help keep the transmissions safe. Apart from that, the K63 wireless has blue backlighting instead of the wired K63’s red are both controlled by the Corsair CUE software. Carrying over from the wired version are the full Cherry MX Red switches, media keys, and full n-key rollover. 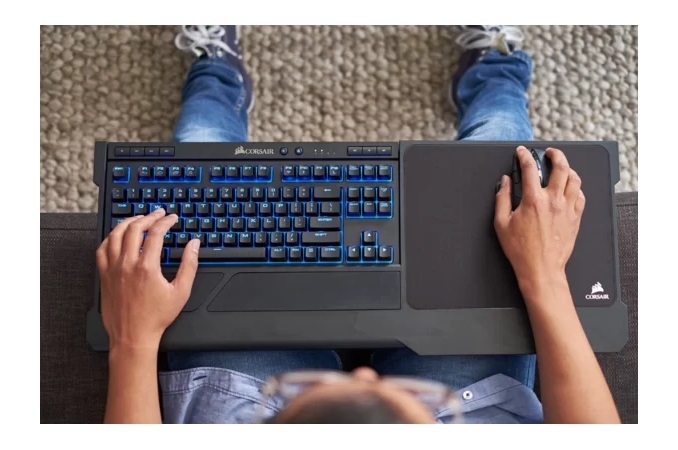 Realizing the need for a compact wireless mechanical keyboard would be good for living room gaming, they have included a lapboard with it. While it is similar to the Corsair’s own lapdog, that is a wired solution. The lapboard here is wireless which saves a lot of space where the cables were placed allowing room for a wrist rest. The entire setup is also lighter weighing in at almost 6.5 lbs./2.94 kg (2.4 lbs./1.09 kg for the keyboard itself), compared to 5.8 lbs./2.63 kg for the Lapdog alone. The Cherry MX Red keys themselves keep the 1000 Hz report rate and the keyboard retains the MUTE, VOL UP/DOWN, STOP, PREV, PLAY/PAUSE, and NEXT media keys. Wired connectivity goes through USB 3.0/3.1 Type-A connector, is 6' long, and charges its Lithium-ion battery through there as well. The K63 wireless keyboard is available now for $110 (keyboard only), or $160 with the keyboard and lapboard. Gigabyte Launches Splash-Proof AORUS K9 Optical Keyboard with Infrared Switches. Leon Chan contributed to this report. Enough latency can make even a nice simple sidescrolling platformer unbeatable. Are there even enough people playing FPS games (or other keyboard and mouse games) on their TV on a PC while sitting on a couch to justify the existence of this? Well considering the LapDog has been around for a while now, yes there is a demand. Just because you have absolutely no need for a mechanical wireless keyboard, does not mean others don't. I also think Corsair might just know the market demand for such a product better than you. Keyboard and mouse are great controls for gaming. Sitting in front of a TV on a couch to play the kinds of games that you use a keyboard and mouse for is the thing that strikes me as a competitive disadvantage, compared to sitting in a chair in front of a gaming monitor. I've certainly found the high latency of TVs annoying. If it's all I've tried for a while, then I don't notice as much, but after using a low latency display everything just seems off and playing all games is harder.